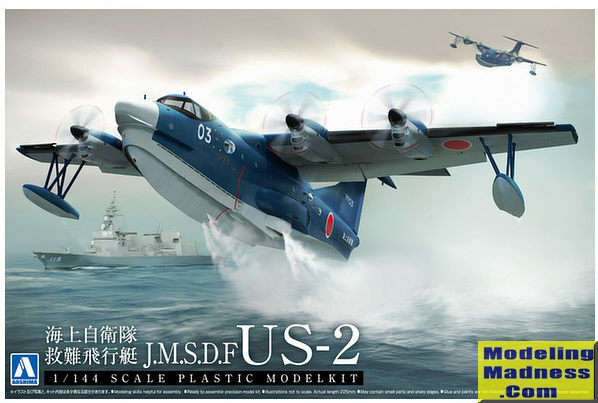 With the US-1A fleet beginning to show its age, the JMSDF attempted to obtain funding for a replacement in the 1990s, but could not obtain enough to develop an entirely new aircraft. Therefore, in 1995, ShinMaywa began plans for an upgraded version of the US-1A, the US-1A kai (US-1A 改 - "improved US-1A"). This aircraft features numerous aerodynamic refinements, a pressurized hull, and more powerful Rolls-Royce AE 2100 engines. Flight tests began on December 18, 2003. The JMSDF purchased up to 14 of these aircraft and around 2007, it entered service as the ShinMaywa US-2. Typical of modern Aoshima kits, this one is superbly molded. You get a lot of parts in the box and while I'm not a fan of dark blue plastic, it will probably make painting a bit easier. I very much like that the kit comes with a stand, though it is one that looks fairly complex and is quite articulated. The kit provides several options. One is to have the landing gear raised or lowered and there are separate pieces to take care of that. You can also have the flaps lowered if you wish. For those who are concerned about tail sitting, there are weights provided. One fits in the nose radome while the other is trapped in a cavity between the nose gear well and the cockpit. The cockpit is a single piece that has seats and an instrument panel, but little will be seen once it is installed. There are quite a few small pieces that fit on the upper fuselage so one does need to take care not to lose anything. The landing gear are also well done with the usual small wheels. Each of the engine nacelles is a separate item with the prop shaft being held in place with a polycap. I'm not sure if one can install the cap and after all is done, then install the prop or not so it is something to check out during construction. 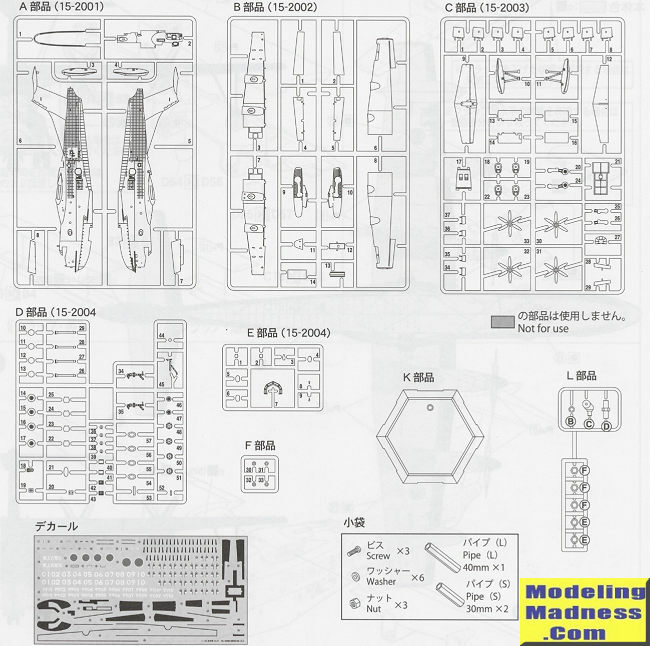 Instructions are well done and offer the usual Gunze paint references. Most of the instructions are in Japanese, but there are enough English words to help out where needed. There are markings for at least ten planes, which differ only by nose and serial number. 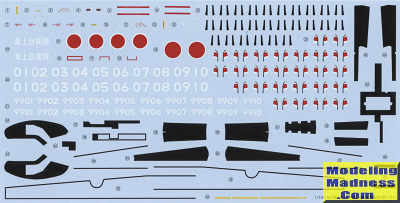 All of the black areas are provided on the decal sheet as are the prop blade markings. All those small markings you see on the upper right, well those are for the prop blades so that will be fun! The fairly large sheet is nicely printed and my experience with modern Aoshima decals has been quite positive. The aircraft are light grey on the underside, which is listed as FS 16440 light gull grey. For the upper blue it is recommended that you mix two Gunze shades, shallow ocean blue and deep ocean blue in a 50/50 ratio. I am a fan of these sorts of planes though I don't build all that many. This one is perfect for most as the finished model will have a length of a bit over 9 inches, meaning it will fit on most display shelves. A real plus regarding the display stand is that it is topped with a cradle on which to rest the model so no need to have holes in the bottom of the model.